Overall, U.S. digital ad revenues grew by 23.1 percent to $49.5 billion in the first half of 2018, adding more than $9 billion compared to the first half of 2017. That put digital on track to exceed $100 billion in annual ad revenues for the first time, according to the Interactive Advertising Bureau’s (IAB) Internet Advertising Revenue report for the first half of 2018, released Tuesday. “Typically, first half revenue trends lower than second half. That we’ve see 23 percent growth this year from January through June, while simultaneously witnessing the continued decline in ad spend on traditional media, indicates that the industry dollars — which were slow to follow actual consumer behavior — are now aligning appropriately,” said IAB’s Senior VP of research and measurement Sue Hogan in a release announcing the report findings. Social media growth inches up. At $13.1 billion in the first six months of 2018, social media ad revenues grew 38 percent from the first half of 2017. That’s up just slightly from 37 percent growth seen last year, and off from growth that surpassed 50 percent in the first half of 2014 and 2015. Source: IAB Internet Advertising Revenue Report, Half-Year 2018. 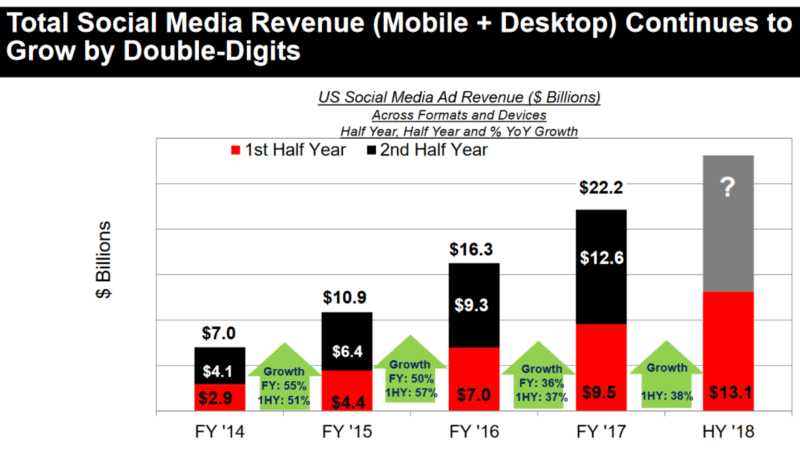 Social is on track to exceed the $22.2 in total ad revenues seen last year. Video ads take bigger piece of market share. Search still accounts for the largest share of digital ad revenues, but it’s foothold is shrinking. Video’s share, meanwhile is growing. It now accounts for 14 percent of all digital ad revenue, up from 12.9 percent a year ago. In terms of formats, video ads (across channels) saw fastest growth at 34.8 percent in the first half of the year. Revenues topped $7 billion at the end of June. At $7 billion during the first half of the year, on track to exceed the $11.9 billion generated in 2017. Mobile accounted for the majority of video ad revenues at $4.2 billion, up 60.5 percent. Desktop drove $2.8 billion in video ad revenues in the first half. The IAB reports that nearly 75 percent of all internet time is spent on a mobile device, with 220 million users streaming digital video in a typical month. Why it matters. The IAB’s half-year report shows digital growth continues to outpace traditional media, which is estimated to have grown by just 3 percent in the first half of the year, according to Nielsen. Marketers continued to increase investments in social media, despite ongoing negative headlines and scrutiny from regulators, and video will likely continues to be a key growth driver across all channels. However, growth is not climbing as quickly as in years past.